Last Thanksgiving I watched some of the Mystery Science Theater 3000 Turkey Day Marathon with my then almost there-year-old daughter, Ava. It went OK, so a year later I decided to revisit the idea with my almost four-year-old, taking notes while it happened. After explaining that Gypsy is a girl robot: “There’s a girl robot in Bender!” (That’s what she calls Futurama. “Did you just say ‘shhh’?” She seemed to understand that Mike and the bots voices were not part of the movie itself, but their riffs were possibly coming from me. On Tom Servo: “Does that robot have eyes? The one with no eyes. How does he see? 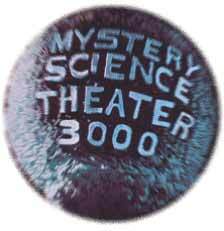 Dull surprise: I have to mention that there’s currently a Kickstarter campaign to revive Mystery Science Theater 3000. It’s hit its initial goal, but creator Joel Hodgson is trying to hit a total goal of $5.5 million to produce a full 12 episode season. Give, won’t you.